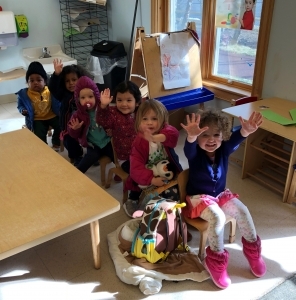 Toddlers spend their day engaged in activities and experiences designed to meet their emerging skills in language, social awareness and self help. 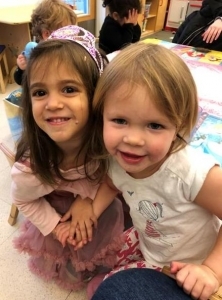 With the solid support of a patient and caring teaching staff the foundation for later learning in the preschool years is established. 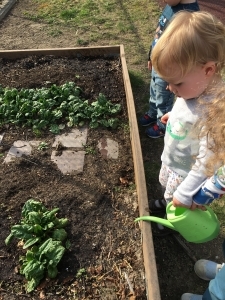 Toddlers are active participants in the Feed Me Fresh nutrition program, planting rows of seeds and using all their senses in discovering new foods. The Toddler program is also a popular hit for dancing with the “Grandmas and Grandpas” in our JEWEL intergenerational program each day. The toddlers use “Creative Curriculum” in the classrooms. 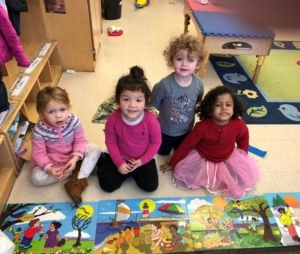 This curriculum focuses on guided developmental activities in the areas of language, socialization, gross motor development, fine motor development and sensory skills. Lesson plans are created to include a balance of active and quite play and structured and free play activities. Because of child to teacher ratios, we are able to create programs that meet the individual needs of each child. 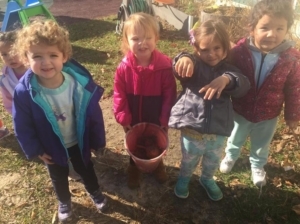 MKCCC provides a safe and attractive child-sized environment with a variety of toys, materials and equipment available for discovery and exploration. Toddlers are just beginning to learn about being part of a larger group. Teachers help them become more socially aware by allowing them to express their emotions and by building their self esteem. We build each child’s self esteem by telling them and showing them that we know they are lovable and capable. Throughout the day we work on self help skills such as feeding themselves, using the toilet and putting on their own shoes. These are just a few of the accomplishments that help children feel good about themselves. Children at this age are just beginning to develop language and can be easily frustrated. Teachers are available to give children the words and act as role models to teach, to negotiate, and to compromise. Being part of a community requires the ability to understand limits and boundaries. Children are taught to follow classroom routines and have respect for situations which may be unsafe. Formal meetings between the teachers and parents are scheduled in the fall and the spring. At that time, we discuss each child’s progress, goals and evaluate how the program is working for everyone.